BUT, the project still exists and we will continue to update and maintain our dataset of vernal pool locations and herpetological (reptile and amphibian) activity. New Jersey is home to a multitude of Endangered and Threatened species. Any member of the public can report the sighting of an Endangered or Threatened species using a form available through the following web address: www.njfishandwildlife.com/ensp/rprtform.htm. Endangered or Threatened species found using a vernal pool need only be reported on the Vernal Pool Data Sheet. Anyone can report the location of a new vernal pool or the activity occurring within an identified vernal pool using a Vernal Pool Data Sheet available online at www.dbcrssa.rutgers.edu/ims/vernal/vol.htm. 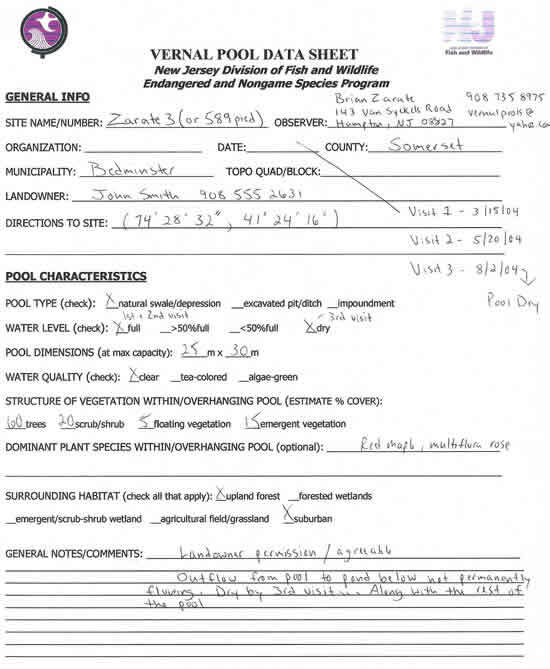 Prior to reporting your information to us, please refresh yourself on vernal pool ecology by reviewing the documents at www.njfishandwildlife.com/ensp/vernalpool.htm as they may be helpful in assisting you in correctly documenting your observations. With the absence of an official training seminar, more stringent quality control measures must be taken to ensure the validity of data submitted for this project. Even if you're a current volunteer who has attended a seminar in the past, please review the instructions below to guarantee that your data will be properly collected. Data reporting to the ENSP is simple. (A) Choosing one or more pools from the database maintained at www.dbcrssa.rutgers.edu/ims/vernal. This interactive website, maintained by Rutgers University's Center for Remote Sensing and Spatial Analysis (CRSSA), provides updated coverage of vernal pool distribution and status throughout the state. Many vernal pools have already been digitally mapped by CRSSA and assigned a unique ID name, such as 1234rvh or 567ocp. Please be sure to include the full ID name (both numbers and letters) when submitting data for a vernal pool located through the interactive map site. Also, all mapped pools are color coded to define their current survey status (color definitions can be viewed by using the legend tool). Pools colored Yellow or Blue need to be surveyed. Yellow pools have never been observed, while Blue pools have been deemed "vernal" but not certified using herpetological data. (B) You may already know of a vernal pool you'd like to survey. Not every vernal pool in the state has been mapped by CRSSA. Please reference the CRSSA map to verify that your pool has not been already assigned an ID name. If it has, use this ID name on your report form/survey sheet. If it is a new pool to the database, just use your last name followed by a number to identify the pools on your report forms (ex. Smith 1, Smith 2, Smith 3). It is important that we do not duplicate surveys or misidentify pools. Collecting data at a vernal pool is as easy as filling out the data sheet. The forms are available online for printing out under the "Volunteers" link on the CRSSA website, www.dbcrssa.rutgers.edu/ims/vernal/vol.htm. Please fill out forms to the best of your ability. Always secure landowner permission prior to surveying habitats on private land. Ideally, provide photos (digital or otherwise) of both the pool and species observed to support your findings. Please include your name, address and phone number or email address under the "Observer" field in case we need to contact you to verify information. We cannot accept data from an unidentified observer. Use the unique ID name designated by CRSSA or your own site name if it is a new pool to our database. Make every attempt to identify the exact location of your pool if it is a new pool. Written directions are often not enough for us to accurately map a pool into our Geographic Information System (GIS) software. The best way to identify a new pool location is by using a Global Positioning System (GPS) unit and noting the coordinates. Also acceptable is a well-defined mark on a printed out map from the CRSSA site or some other website with mapping software. ENSP adds new pools to our database using aerial photography as a spatial reference. Being aware of how our program maps new pool locations may be helpful to you when attempting to communicate location data to us. 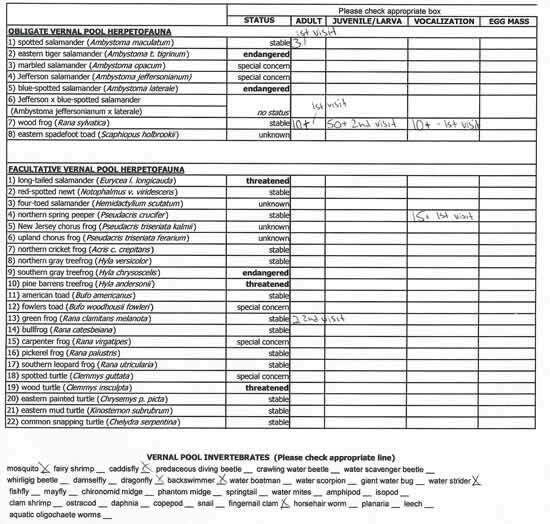 An equally important section of the data sheet that needs careful attention is the species checklist. It is this data that will ultimately decide whether or not a vernal pool is certifiable, affording it regulatory protection. In addition to simply checking the appropriate box, try to record an estimate of numbers of individuals observed. Photographic documentation is mandatory for observers that have not attended a prior vernal pool training seminar. A single vernal pool may be visited several times over the course of its annual cycle to definitively document its herpetological activity for that year and/or its ephemeral nature. You can use one data sheet per visit per pool or neatly combine all information and visit dates on a single data sheet per pool. It must be clear as to what dates certain pool characteristics or species were observed. Your dates should reflect when you were at the pool and not when you filled out the sheet. See the sample form - front and sample form - back. It is just as important to note dates when vernal pools are filled with water as it is when they are dry. The absence of water in a pool addresses some of the defining criteria of what a vernal pool is to our regulatory program. Or use the online submittal available at www.dbcrssa.rutgers.edu/ims/vernal. Directions are available on the web site on how to do this. If you have additional questions after reviewing the information here and on the CRSSA site, please e-mail Brian Zarate at brian.zarate@dep.state.nj.us or phone him at 908-638-6482.